On behalf of the Quartzsite Area Chamber of Commerce & Tourism and everyone in the Quartzsite region, we welcome you. a 750 mile Off Road Vehicle (OHV) Loop Trail system from Yuma to Bullhead City. Riders will experience dramatic elevation changes that range from 170 ft. along the banks of the Colorado River to the 7070 ft. mountain tops in the Hualapai Mountains. The Arizona Peace Trail is ideal for a day trip to explore around Quartzsite. Or take an overnight adventure or several days expedition! Combine the Arizona Peace Trail with over 1,000 miles of BLM designated OHV trails in the Quartzsite area. To learn more visit www.ArizonaPeaceTrail.org. 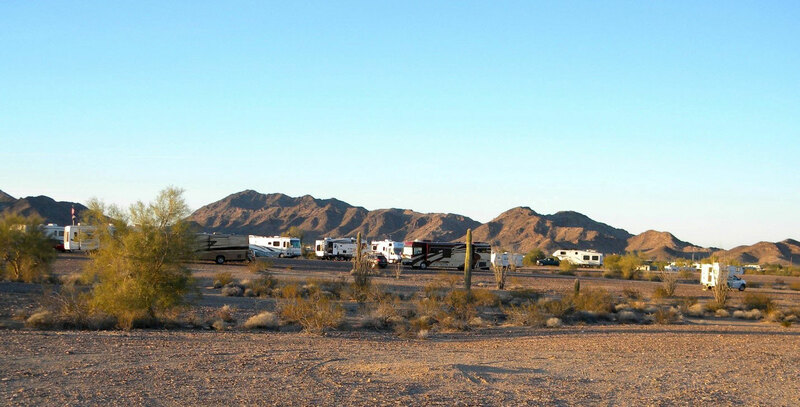 Quartzsite is known for its RV and ATV friendly atmosphere. 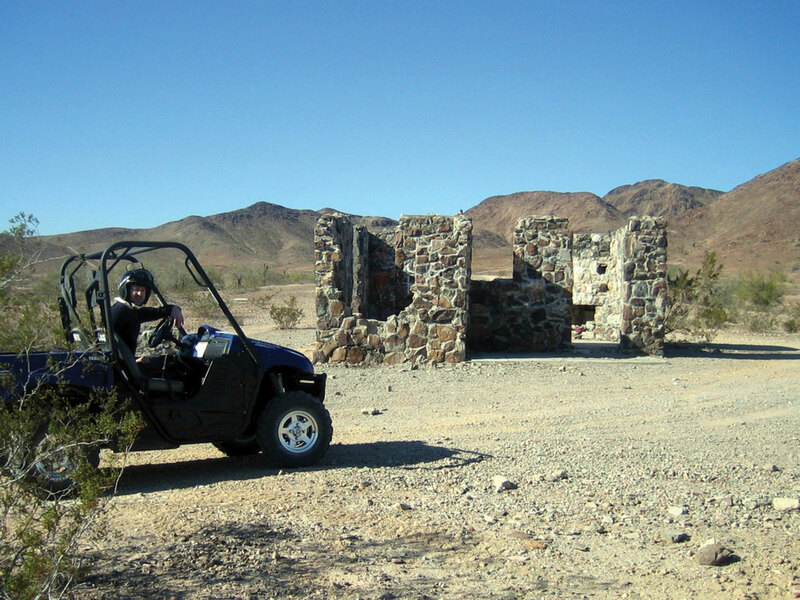 ATV trails lead in all directions room town with beautiful desert scenery along the way. For ATV and 4-Wheel drive enthusiasts there are hundreds of miles of roads and trails to take you into every nook and cranny imaginable. From slot canyons and blue faced mountains to cool oases and tall peaks, there is something for everyone. Quartzsite is a small town in the Arizona desert off I-10 that is surrounded by BLM land, only about 17 miles from the southern California border and 100 miles from Mexico. While normally a quiet desert community during the summer, it starts filling up in October with winter RV snowbirds seeking to avoid snow shovels and heating bills. The local population swells from as little as 3,000 to over 2 million. The real influx happens in January when the annual RV swap meets occurs. The swap meets takes over the entire town with hundreds of vendors selling anything from common house tools and cooking gear to specialized wares for RVers including RVs. Thankfully, there are plenty of RV parks in town or nearby and lots of BLM land where RVers can boondock without utilities free or nearly free. What to do once you get here? The La Posa Long Term Visitor Area (LTVA) was created in 1983 to fulfill the needs of winter visitors and to protect the local desert ecosystem from over-use. The campground is approximately 11,400 acres in size, flat landscape, sparsely vegetated with plants such as Creosote bushes, Palo Verde trees, Ironwood trees, Mesquite trees and various species of cacti. Campers must be 100% self-contained for waste and gray water in order to utilize this area since vault toilets are not provided. A Special Recreation Permit is required September 15th - April 15th. Camping is allowed in the LTVA between April 16th - September 14th at no cost, but the standard 14 day limit applies. Host and services are not provided during the off-season. Fees are $180 for long term permits valid for 7 months and $40 for short term permits valid for 1 to 14 consecutive days. There is no limit to the number of short term permits that can be purchased. These sites are not considered overnight campgrounds so the minimum fee for camping is the $40 permit. During the off-season, the standard BLM camping regulations and 14 day limit with no fee applies. The permits are valid in any of the six LTVAs in California or two LTVAs in Arizona. Permits may be purchased from the Bureau of Land Management Yuma Field Office or on-site from the LTVA host. Many RVers trek to AZ during the winter months, to camp in the desert in designated Bureau of Land Management areas. Those who have made the trip are familiar with the various BLM locations and may even have a favorite stretch of desert to pull into. If you are doing the "Quartzsite thing" for the first time, a bit of an orientation to the area may be helpful. Quartzsite consists of the area surrounding the four corners where Interstate 10 and U.S. Highway 95 intersect. There are two roads which parallel I-10: Main Street runs north of 10 and Kuehn Street runs south of 10. Once settled on your piece of Quartzsite BLM land...it's off to the shows. Mostly it's about meeting new and old friends out in the desert. And browsing the vendors' wares at the shows and in various flea markets. You can make the climb to the top of Q Mountain for a nice view, visit Hi Jolly's gravesite, or take a day trip to see some petroglyphs. Count on being dusty - you won't be disappointed. Relax and enjoy the sunny skies and warm to moderate winter temperatures. 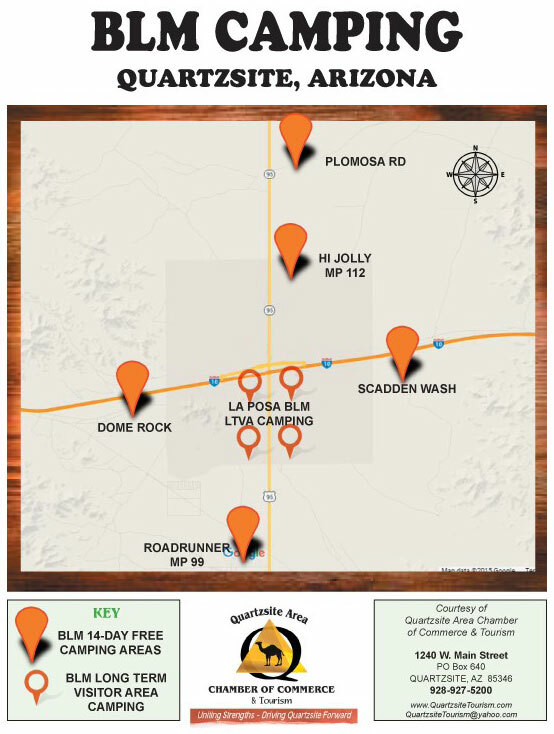 There are also a number of private RV Parks, Campgrounds & Mobile Homes, in Quartzsite, as well as some pay showers and a couple Laundromats. Take the time to drive around the area and see what there is that might be going on. You will meet plenty of RVers who can help with any questions. This area is special – Not just for its popularity as an RV Winter camping area, and its show and Swap meets. The area is also favored by ATV and Off-road enthusiasts for its Trail systems. But this area is rife with other discoveries as well. Above all, we hope you feel welcome here. However you choose to spend your time in Quartzsite, we want to do whatever we can to make your experience extraordinary. In fact, we hope you come to love it here as much as we do. The Hi Jolly Cemetery is operated and maintained by the Town of Quartzsite for the purposes of providing a cemetery, historic site and park. The Hi Jolly monument is in the pioneer section of the cemetery. The monument is a favorite of visitors to Arizona. 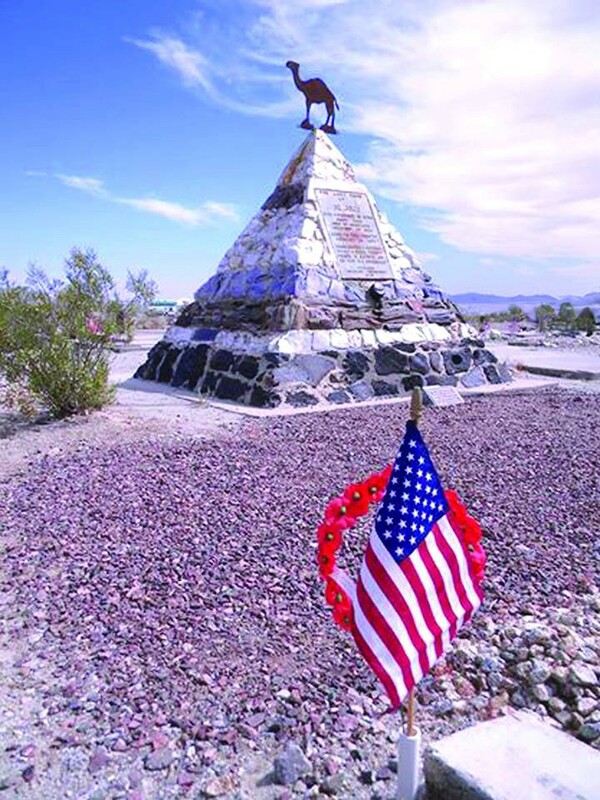 The Hi Jolly Memorial at the cemetery in Quartzsite pays tribute to Hadji Ali, one of several camel drivers brought over by the U.S. Army in a failed attempt to introduce camels to the American Southwest. After the experiment was abandoned, Ali was the only driver to remain in Arizona. He took up prospecting, and became known to locals as “Hi Jolly”. He is by far the most colorful of the camel drivers because he remained in the desert southwest and became a prospector, scout and was a courier for what was called the Jackass Mail. He was a packer, hauling freight in the area also. Hi Jolly died in December of 1902. In 1934 the Arizona Department of Transportation erected a monument over his grave. A community working together to make a child's dream come true. Celia's Rainbow Gardens, located in the Quartzsite Town Park encompasses 8 acres of the 40 acre park. The gardens were inspired by the dreams of Celia Winer, an 8-year old girl whose goal in life was to make the world a better place. Her love of nature, her desire to save the environment, and dreams of people working together have been taken to heart by this little desert community. The Bouse Fisherman is an Intaglio also known as a geoglyph or earth figure. These very large earth figures were created many years ago by American Indians. The fisherman was first spotted in 1932 on the desert floor when George Palmer, a pilot, saw an enormous human figure with outstretched hands. In 1984, the Colorado River Indian Tribes sponsored a flight which led to a second discovery of the Bouse Fisherman. Bouse residents and others collected money and installed posts and a cable fence around the site. A bronze plaque was set into a stone pillar to commemorate the site hoping for preservation for all. To get there - North out of Quartzsite on Highway 95 for 5.4 miles, then turn right on Plomosa Road. 6 miles up the road look for fences on your left. On the East side of Tyson Wash a short distance south of Quartzsite, you can see Indian grinding holes and some faint petroglyphs. There is also a natural tank near the cliff which may have water in if it has rained. This is the site of the original Quartzsite washed away in a flood and subsequently rebuilt on higher ground at its present location. It is said that a safe full of gold lies buried beneath the sand at the bottom of Tyson Wash somewhere near this spot, carried away in the great flood. To get there - Go South on highway 95, turn right into the BLM Long Term Visitor Area, then left on the main road. Turn right at the BLM road 358. Park just before Tyson Wash and look for the petroglyphs on a rocky outcrop. Across the wash on the opposite cliff you will find grinding holes and caves where Indians once lived. There are hundreds of Petroglyphs here. You will also find the remains of an old stone cabin and an arrastre. Look along the base of the cliff to the left of the stone cabin for the cave where the spring originates. Once you’ve found it, listen and you will hear it dripping from the cave roof, forming a year round pool of water. A path takes off to the left of the cave, following the edge of the cliff where more petroglyphs can be seen. Dripping springs is one mile down the road from Dos Picachos Mine. The road is steep and rutted. This is a trip for a 4-wheeled drive vehicle. Bordered by the Yuma proving ground to the west and the Kofa National Wildlife refuge to the east the refuge is an excellent place for viewing desert plants and wildlife, rock climbing, exploring old mines, or just camping in remote wilderness. An area of rugged beauty, Palm Canyon may be the only place in Arizona where native palm trees, California Fan Palms, can be found. tucked away in narrow, rugged canyons on the Kofa National Wildlife Refuge. People were aware of the small, scattered clusters of trees growing in Palm Canyon even before the creation of the refuge. The palm trees have become a major visitor attraction for the refuge. To get there - Drive South on Highway 95 for 23 miles then turn left into the Kofa Wildlife Refuge for approximately 7 miles on the dirt road until it ends. Paul Winer has achieved legend status after 20 years as the naked guy who has The Oasis Bookstore in Quartzsite, Az. In the face of predictions already accepted as fact—that bookstores are about to join the dodo bird and doctors who make house calls—Paul Winer has a business model that works . . . for him. His image has appeared in hundreds if not thousands of private blogs and the occasional print publication. But when the ogling and eye-balling are done, it is worth it to stick around to learn the story of this life-long performer and point man on freedom of expression litigation. Paul Winer was a Vermont poet as a young man. His poetry became lyrics and Paul embarked on a career as a performer of blues and an accomplished pianist. Paul states “I was in court 68 times and won every case. I was at the center of some landmark freedom of expression cases." When asked Paul replies simply "It has nothing to do with philosophy or being connected to Nature. I am not a poster boy for nudism, naturism, or sun worship. I just don’t like the feel of clothes." Located in the flood plain of the lower Colorado River and surrounded by a fringe of desert ridges and washes. The refuge encompasses both the historic Colorado River channel as well a channelized portion constructed in the late 1960's. Along these main water bodies are home to many wildlife species that reside in this portion of the Sonoran Desert. Established in 1995 the preserve currently consists of 1,253 acres of wilderness area and a 3.5 acre park. The preserve is centered around a reconstructed Colorado backwater, which offers a variety of activities including fishing, canoeing, birding and swimming. The preserve's many purposes include revegatation of areas for endangered and threatened plants and animals native to the Lower Colorado River Basin.